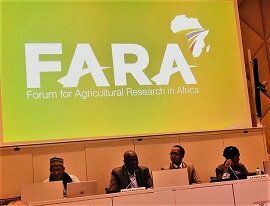 The mission of FARA is to contribute to generating high, broad-based and sustainable agricultural growth by catalysing improvements to the productivity and competitiveness of the sector through increased and effective application of Science, Technology and Innovation (STI). FARA executes its mission by performing the following functions within the context of supporting the implementation of the Science Agenda for Agriculture in Africa: (i) advocacy for increased application of STI in agriculture which is a necessary condition for achieving national and continental agricultural development goals; (ii) strengthening the human, institutional and systemic capacities for agricultural innovation; (iii) facilitating the exchange of information and knowledge in STI for agriculture; and (iv) facilitating partnerships among research, innovation and agribusiness actors within Africa as well as between Africa and external regional or national entities. FARA’s Board of Directors provides governance oversight of FARA on behalf of the General Assembly. To this end, the Board holds two ordinary meetings annually. The Board’s membership includes a non-executive Director position for a Governance Expert who is charged with advising the Board on legal and governance matters. The main role of this position is to serve as a member of the Board of Directors of FARA with specific responsibilities for advising the Board on governance issues including strengthening the governance organs and processes of FARA and enhancing the effectiveness of these organs in performing their functions. Advise the Board and its Committees on all issues concerning corporate governance. Strengthen compliance by the Board and its Committees, and the FARA Secretariat, with FARA’s Governance policies and procedures. Review and continuously improve the Board’s self-assessment tools. Advise the Board on emerging trends of good corporate governance practices. Advise on amendments to the Governance Manual of FARA to ensure that FARA’s governance is in conformity with modern good corporate governance practices. The Governance Expert on the Board of FARA is be expected to deliver the functions as prescribed above and as may be directed by the Chairperson of the Board from time to time. The Governance Expert is expected to undertake the duties outlined in Section C above with the highest standards of professional and ethical competence and integrity, and in an effective and efficient manner. The Governance Expert will report to the Chairperson of FARA. FARA invites eligible individual consultants to indicate their interest in providing the services. Interested individual consultants must provide information indicating that they are qualified to perform the services (brochures, description of similar assignments, experience in similar conditions, availability of appropriate skills among staff, etc.). Expressions of interest must be delivered by e-mail to the address below on or before October 27, 2018 to.